With all the sadness and horrible things happening in this world, I refuse to wallow in I had a crappy work week, focused on "projects" for our team building meetings next week in Florida. If I'm being honest, the truth of the matter is these particular exercises had me digging into areas I not as familiar with and using a different way of thinking so while I found it tedious, when the experience is over I will walk away from the meetings with a stronger skill set which will make me better at my job.. but juggling all that with my every day responsibilities, coupled with my underlying nerves about the Rocky half this weekend that I am ill-prepared for due to my recent foot injuries, I got in my own way. When I wrote my poem the other day, it wasn't for me, it was for anyone who needed it, but ironically it became me who needed it. Sometimes I scare myself because there are no coincidences.. my subconscious knew before I did that I was having some moments of self doubt. As I sit here sharing with you basically the same things I was going to share, it is from and entirely different perspective... one with less attitude and more understanding and willingness to look past the minutia and focus on the rewards that will follow. My dad was a garbage man by trade, when he retired and we threw him a surprise party I was in charge of the invitation.. So I came up with a card that had a picture of a garbage truck on the front with the words that said, "sometimes you have to dig throw the garbage, to get to the treasure" and inside was a picture of him on vacation sitting in a chair smiling. PS he's 82 and still works part time, so apparently one man's garbage is another man's treasure. I love this space, I love putting my thoughts into words on paper or the computer. I've always been good at resolution, but actually writing it out, laying a path to move forward or put it to rest, was the one piece that was missing from the puzzle. Thoughts enter my mind sometimes and take me by surprise, while I have a very good memory, some things are lost if not written down and it turns out some things are not completely resolved until I share it with myself and now all of you! Have a tremendous Friday, I got a lot to do, but I will focus on one thing at a time, and when I feel myself getting bogged down and stressed out, I will stop take a deep breath, smile and say good things are coming... of this I am sure! We all have these kind of days, just adapt and overcome! Well said!!!! Have a great day! Keep writing. I see your talent and I am a pretty good writer myself. One foot in front of the other. One day at a time. Thank you. 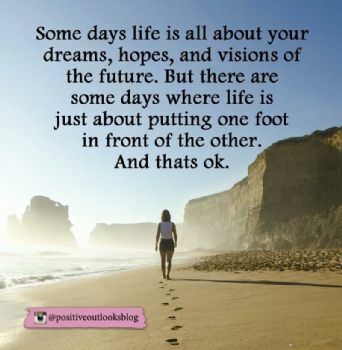 I know I have had many days of the putting one foot in front of the other variety. You seem to have a great attitude...best wishes to you as you move forward. Wonderful blow, very heart warming. I have always felt it is always good for the soul to write down your feelings, even if you do not share with others it is always great to unload on a blog. Thanks again for sharing! Sometimes it's because of what we're focusing on. On those down days, get out your gratitude journal, read over it, and add to it! Have a happy Monday! And that's okay. Beautiful blog. I'm sure your dad considers you a treasure too! Some days it is very tough to be a positive light when the world gets dark but we have to keep reminding ourselves that our light can light up any dark place. We can be the light every day to some one along the way. You are doing that with each blog. your Popular blog, that meant a lot to all of us! I like the card you made for your Dad. Wise words....awesomely motivating and encouraging! that's what happens. When you start putting things on paper it comes out different than you expect! Great blog. Thanks for sharing your wise tips. Thanks for reminding me. Great blog! Glad to see your blog featured in the Spark mail. on your Voted Featured Blog Post! I went through a period of time when all kinds of negative things were happening. I had a jar that I bought at a craft fair when I was teaching. It said on it, "Ashes Of Problem Students". What I did was write down my worst problems on a piece of paper and put them in the jar. Every six months or more, my task was to open the jar and read what was written on the papers. The funny thing was, six months out, all of the issues that had bothered me seemed trivial except one. It was a guy in the neighborhood who had been harassing us. Two years later, the person's stupidity caused him to lose his house to foreclosure. He left the neighborhood and the harassment and gossip stopped. We never had to do a thing. What I'm trying to say is that I dumped my fears on a piece of paper and let them go. All of them eventually got solved. Thanks for writing down your thoughts! I thought I was the only one who woke up cranky, lol. Love the story about your dad--hope he's doing well ;-). Thank you for sharing. I can relate and it is a blessing to know other's have the same struggled and thoughts. Have a Blessed day! Your life and struggles sound very much like mine. Good to know I'm not alone.